Piara Singh Gill was a well-known Indian Nuclear Physicist. Piara Singh Gill was born to a Sikh Gill, Jat family in Hoshiarpur district, Punjab. In order to attend primary school, he walked 10 km. He matriculated from Khalsa High School, Mahilpur (1928) and as per the custom of the village, Gill sailed for America (1929). In 1932, Gill completed his junior college. He earned a merit scholarship at the University of Southern California and completed his Bachelor’s and Master’s degrees (1936) from University of Southern California. He joined the doctorate program in October 1936 at the University of Chicago. His supervisor was Professor of Physics, Arthur Compton who won the Nobel Prize. The Crompton group was interested in the latitude effect of cosmic rays. Gill took several sea voyages from Vancouver (Canada) to Tasmania (Australia) to collect his data (1938-39). Gill was awarded the Ph.D. in Physics in the year 1940. Gill presented a paper on the ‘Size-frequency distribution of cosmic ray bursts’ at the International Symposium on Cosmic Rays (June 1939). It was the first experiment showing the clues about the spin of the pi-meson that was predicted by the Japanese Physicist Yukava. Gill wanted to come back to India and work for the country. Compton gifted the cosmic ray equipment that was built by Gill at Chicago. Gill had planned to carry out experiments on the azimuthal variations of cosmic rays so he returned to India in April 1940. Gill served to Indian research over his long career namely: Former Christian College, Lahore, Tata Institute of Fundamental Research Bombay, Atomic Energy Commission Secretariat, New Delhi. Aligarh Muslim University, Central Scientific Instruments Organisations. Lahore: Gill began his research laboratory to continue the work he had started in Chicago (summer, 1945). He used a Royal Air Force ‘Mosquito’ plane and flew up to heights of 33,000 ft. He found mesons were produced beyond 20,000 ft.
Tata Institute of Fundamental Research Bombay (1947-48): Gill befriended his colleague, Homi J. Bhabha who offered him a research fellow professorship at Tata Institute of Fundamental Research. Gill used hydrogen-filled balloons to send his apparatus to high altitudes. Thus, he recorded the data transmitted on a tape on the ground. Since he was unsure of his future prospects, he left TIFR and looked for better positions in India and USA from July 1948 to August 1949. On September 1, 1949, Gill was in charge of the Department of Physics, A.M.U. He modernized the laboratories in Cosmic Rays, Nuclear Physics, and Microwave Physics. Also, he started courses in Theoretical Physics. In 1951, Gill set up a high altitude laboratory at Gulmarg. His students studied the variations of cosmic rays and extensive air showers at high altitudes. Gill was appointed by Nehru as the Officer-on-Special Duty (OSD) with the Atomic Energy Commission, New Delhi. 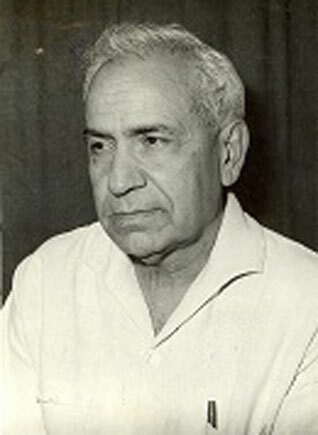 Gill shifted to Chandigarh where he served as Director of CSIO (September 1963 to October 1971). He selected devoted young scientists and launched their careers in the development of new instruments in optics, electronics, environmental medical electronics and process control. In addition, Gill created advanced scientific instruments designed in Asia. He advised the nuclear weapons strategies (1950-60s). After retiring, Gill wrote physics textbooks for high schools. These were translated by his student, H.S. Virl into Punjabi and published by Rupa & Co, Delhi. In 1972, Gill migrated to Atlanta, US, with his daughter. Gill passed away when he was 101 on 23rd March 2002.